"A Game of Shadows" redirects here. For the Mannix episode, see Mannix (season 6). Sherlock Holmes: A Game of Shadows is a 2011 period action mystery film directed by Guy Ritchie and produced by Joel Silver, Lionel Wigram, Susan Downey, and Dan Lin. It is the sequel to the 2009 film Sherlock Holmes, and features the Sherlock Holmes and Dr. John Watson characters created by Sir Arthur Conan Doyle. The film's screenplay was written by Michele Mulroney and Kieran Mulroney. Robert Downey Jr. and Jude Law reprise their roles as Holmes and Watson, and were joined by Noomi Rapace as Simza, Stephen Fry as Mycroft Holmes, and Jared Harris as Professor Moriarty. Although the film follows an original premise, it incorporates elements of Conan Doyle's short stories "The Final Problem" and "The Adventure of the Empty House". In the film, Holmes and Watson travel across Europe with a Gypsy adventuress to foil an intricate plot by their cunning nemesis, Professor Moriarty, to instigate a war. Upon its release, the film received mixed reviews from critics but was commercially successful, with a worldwide gross of over $545 million. A further sequel is set for release on December 25, 2020, after having undergone nearly a decade in development hell. In 1891, Irene Adler delivers a package to Dr. Hoffmanstahl, payment for a letter he was to deliver. Hoffmanstahl opens the package, triggering a hidden bomb that is prevented from detonating by the intervention of Sherlock Holmes. Holmes takes the letter while Adler and Hoffmanstahl escape. Holmes finds Hoffmanstahl assassinated moments later. Adler meets with Professor Moriarty to explain the events, but Moriarty, deeming her position compromised by her love for Holmes, poisons and kills her. Later, Dr. Watson arrives at 221B Baker Street, where Holmes discloses that he is investigating a series of seemingly unrelated murders, terrorist attacks and business acquisitions around the globe that he has connected to Moriarty. After meeting up with his brother Mycroft at Watson's bachelor party, Holmes meets with Gypsy fortune-teller Simza, the intended recipient of the letter he took from Adler, sent by her brother Rene. Holmes defeats an assassin sent to kill Simza, but she flees before Holmes can interrogate her. After the wedding of Watson and Mary Morstan, Holmes meets Moriarty for the first time. Holmes subtly requests Watson and Mary be left alone now that Watson is no longer working with him, but Moriarty indicates he will kill them if Holmes interferes. Voicing his respect for Holmes' perseverance, Moriarty informs Holmes that he murdered Adler. Holmes vengefully vows to defeat him. Moriarty's men attack Watson and Mary on a train to their honeymoon. Holmes, having followed the pair to protect them, throws Mary from the train into a river below where she is rescued by Mycroft. After defeating Moriarty's men, Holmes and Watson travel to Paris to locate Simza. When she is found, Holmes tells Simza that she has been targeted because Rene is working for Moriarty and may have told her about his plans. Simza takes the pair to the headquarters of an anarchist group to which she and Rene had formerly belonged. They learn that the anarchists have been forced to plant bombs for Moriarty. The trio follows Holmes' deduction that the bomb is in the Paris Opera. However, Holmes realizes too late that he has been tricked and that the bomb is in a nearby hotel; its explosion kills a number of assembled businessmen. Holmes discovers that the bomb was a cover for the specific assassination of Alfred Meinhard, one of the attendees, by Moriarty's henchman, Sebastian Moran. Meinhard's death grants Moriarty ownership of Meinhard's arms factory in Germany. Holmes, not wishing to repeat his mistake from the previous evening, spies on Moriarty, learning he is travelling to Germany. Holmes deduces it is to visit his newly acquired factory and so the trio follow him there. At the factory, Moriarty captures, interrogates, and tortures Holmes while Watson fights Moran. Holmes spells out Moriarty's plot, revealing that the Professor secretly acquired shares in multiple war profiteering companies using various pseudonyms to conceal his identity and intends to instigate a world war to make himself a fortune. Meanwhile, Watson uses the cannon he had been hiding behind to destroy the watchtower in which Moran is concealed. The structure collapses into the warehouse where Moriarty is holding Holmes captive. Watson, Simza, and an injured Holmes reunite and escape aboard a moving train. Holmes deduces that Moriarty's final target will be a peace summit in Switzerland, creating an international incident. At the summit, Holmes deduces that Rene is the assassin and that he is disguised as one of the ambassadors, having been given radical reconstructive surgery by Hoffmanstahl. Holmes and Moriarty, who is also in attendance, retreat upon a balcony to discuss their competing plans over a game of chess. Watson and Simza find Rene and stop his assassination attempt, but Rene is discreetly killed by Moran. Despite his war being averted, Moriarty remains confident in his victory, warning Holmes that the nations of Europe will inevitably go to war with one another regardless of Moriarty's manipulations. Holmes then reveals that, while being tortured by Moriarty, he replaced the professor's personal diary that contained all his plans and financing with a duplicate. The original was sent to Mycroft in London, who decrypted the code using a book that Holmes had noticed in Moriarty's office during their first meeting, before passing the information to Inspector Lestrade, who seizes Moriarty's assets and donates his fortune to anti-war charities. Holmes and Moriarty anticipate an impending physical altercation, and both realise that Moriarty would win due to Holmes' injured shoulder. Out of options and with the sadistic Moriarty promising to torture and kill Watson and Mary afterward, Holmes grabs Moriarty and lunges backwards over the balcony and into the Reichenbach Falls below. Both are presumed dead. Following Holmes' funeral, Watson and Mary prepare to have their belated honeymoon when Watson receives a package containing a breathing device of Mycroft's that Holmes had noticed and expressed a liking for before the summit. Realizing that Holmes may still be alive, Watson leaves his office to find the delivery man. Holmes, having concealed himself in Watson's office by using one of his urban camouflage suits, reads Watson's memoirs on the typewriter and adds a question mark after the words "The End". After the success of the 2009 film Sherlock Holmes, a sequel was fast-tracked by Warner Bros. with director Guy Ritchie dropping out of an adaptation of Lobo and Robert Downey Jr. leaving Cowboys & Aliens. It was unclear if Rachel McAdams would appear in the film. McAdams said, "If I do, it won't be a very big thing. It's not a lead part". Warner Bros. later confirmed to Entertainment Weekly that McAdams would play a part in the sequel but that it would be a cameo. The female lead role was played by Noomi Rapace. Joel Silver, the film's producer, has said that "we always intended to have a different kind of girl for each movie" in the vein of Bond girls. He found it "complicated" to persuade McAdams to return in a smaller role: "She loved being with us, but she hoped to have a bigger role." Joe Morgenstern of The Wall Street Journal felt "she vanishes all too soon in this overproduced, self-enchanted sequel, and so does the spirit of bright invention that made the previous film such a pleasant surprise." Scott Mendelson of The Huffington Post remarked that she "exhibits far more personality and roguish charm in her few moments here than she did in all of the previous film. Freed from the constraints of being the de-facto love interest, McAdams relishes the chance to go full-villain." The film, then under the running title of Sherlock Holmes 2, was reported to be influenced by Conan Doyle's "The Final Problem". While the film took place a year after the events of the first film, Sherlock Holmes: A Game of Shadows was intended to be a stand-alone film that did not require knowledge of the previous movie. In October 2010, Downey Jr. and Jude Law were seen rehearsing a fight scene as shooting took place in Richmond Park, in southwest London. In October 2010, the steamship PS Waverley was chartered on the English Channel for filming, and a large green screen was erected at Didcot Railway Centre with a large action scene filmed there in mid-November. In late November, a scene was filmed at Victoria Bridge, which is part of the Severn Valley Railway. In January 2011, scenes were also filmed at Hampton Court Palace and areas in Oxford University, Oxford, England. Filming also took place in September 2011 in Greenwich at the Royal Naval College. In early February 2011, principal photography moved for two days to Strasbourg, France. Shooting took place on, around, and inside Strasbourg Cathedral. The scene was said to be the opening scene of the film, as it covered an assassination/bombing in a German-speaking town. The production also filmed at several locations in Kent including Fort Amherst, Knole in Sevenoaks, and The Historic Dockyard Chatham. The White Cliffs of Dover can also be seen in the background of the scene where Watson and Sherlock travel by boat to France. The slow-motion work in the film was done by Gavin Free, an English filmmaker who works for Rooster Teeth Productions and is known for his web series The Slow Mo Guys. The score was composed by Hans Zimmer. Zimmer and director Guy Ritchie traveled to Slovakia, Italy, and France to research the authentic Roma music. Zimmer and his core musicians all with National Democratic Institute members, visited seven Roma villages to learn about the Roma people and "listen to as many musicians as we could." Deeply impressed, Zimmer arranged for 13 of the Roma musicians with their violins and accordions to join him in Vienna at a studio for a recording session. Zimmer wove this Roma music into the score for Sherlock Holmes: A Game of Shadows. Besides discovering the wonderful cultural music, Zimmer also said he had never seen such poverty in Central Europe. A portion of proceeds from the soundtrack will help the Roma pay for necessities like water, heating and bus fare to get their children to school. The soundtrack also contains works of Johann Strauss II, Wolfgang Amadeus Mozart, Ennio Morricone and Franz Schubert. The film was released on 16 December 2011 in Canada, Russia, the United States, the United Kingdom, and Mexico; on 25 December 2011 in most other countries; and on 5 January 2012 in Australia, Poland and Spain. Sherlock Holmes: A Game of Shadows was released on DVD and Blu-ray on 12 June 2012 for Region 1 and 14 May 2012 for Region 2 and Region 4. Jude Law in January 2012 at the film's French premiere in Paris. Sherlock Holmes: A Game of Shadows earned $186.8 million in North America as well as $357 million in other territories for a worldwide total of $543.4 million. It was the 12th highest-grossing film of 2011 worldwide. In North America, it topped the box office on its opening day with $14.6 million, down from the opening-day gross of the previous film ($24.6 million). During the weekend, it grossed $39.6 million, leading the box office but earning much less than the opening weekend of its predecessor ($62.3 million). By the end of its theatrical run, it became the 9th highest-grossing film of 2011 in the US. Outside North America, the film earned $14.6 million on its opening weekend, finishing in third place. It topped the overseas box office during three consecutive weekends in January 2012. It eventually surpassed its predecessor's foreign total ($315.0 million). In the UK, Ireland and Malta, its highest-grossing market after North America, the film achieved a first-place opening of £3.83 million ($5.95 million), over a three-day period, compared to the £3.08 million earned in two days by the original film. It earned $42.2 million in total. Following in largest totals were Russia and the CIS ($28.4 million) and Italy ($24.5 million). Review aggregator website Rotten Tomatoes reports an approval rating of 60% based on 219 reviews, with a rating average of 6/10. The site's critical consensus reads, "Sherlock Holmes: A Game of Shadows is a good yarn thanks to its well-matched leading men but overall stumbles duplicating the well-oiled thrills of the original." Metacritic, which assigns a weighted average rating to reviews, gives the film a score of 48 out of 100, based on 38 critics, indicating "mixed or average reviews". Audiences polled by CinemaScore gave the film an average grade of "A−" on an A+ to F scale. Roger Ebert, who gave the first film three stars, was even more positive in his review for A Game of Shadows, awarding it three-and-a-half stars and calling it "high-caliber entertainment" that "add[s] a degree of refinement and invention" to the formula, and that the "writers…wisely devote some of their best scenes to one-on-ones between Holmes and Moriarty." James Berardinelli gave the film three stars out of four, writing: "A Game of Shadows is a stronger, better realized movie that builds upon the strengths of the original and jettisons some of the weaknesses." Conversely, Keith Phipps of The A.V. Club felt that the film "aims lower than its predecessor's modest ambition, and still misses the mark." On 24 November 2015, film critic Scout Tafoya of RogerEbert.com included A Game of Shadows in his video series "The Unloved", where he highlights films which received mixed to negative reviews yet he believes to have artistic value. He praised the film's deconstruction of action scenes through stylistic editing, one inspired by Soviet montage which was exemplified in Sergei Eisenstein's 1925 film Battleship Potemkin, as well as the friendship and constant banter between Holmes and Watson at the center of the film, which "highlight[s] the difficulty in achieving lyrical deftness of dialogue in films of this budget", with their friendship reminding Tafoya of how "we can invite danger and fun into our lives in equal measure all the time, but once in a blue moon, they make life worth living." Tafoya considers A Game of Shadows to be his eighth favorite film of the 21st century. Warner Bros. Pictures announced in October 2011 that the first draft for Sherlock Holmes 3 was being produced with screenwriter Drew Pearce writing the script; he was later replaced by Justin Haythe. Jude Law commented on the project in late 2013, "We had a meeting earlier this year, the three of us, and I think it's being written now. Warner Bros. have still got to agree to pay for it... I think they want to!" He also said of the delay in getting into production, "I think Warner Bros. wants it, and there's a lot of want from us as a team. We want it to be better than the other two. We want to make sure it's smarter and cleverer, but in the same realm. It's a slow process. We're all busy. So getting us together to try to nail that has taken a little bit longer than we had hoped... I hate celebrating anything I've done, but I'm so proud of those films. I think it was Joel Silver who said, 'Take it out of that dusty room and put it on the street'." In October 2014, Susan Downey stated that a third film was in development: "There's an idea, there's an outline, there is not a script yet. Trust me, the studio would love there to be a script. But our feeling is, we gotta get it right." When asked whether the film would realistically be out within the "next few years", she expressed confidence that it would be, saying, "Yeah. At a certain point it's going to be too long— we've waited too long. We're working as fast and responsibly as we can to get a great script." In May 2015, when asked of the progress of the third film in an interview, Law stated: "There is apparently still a will [to do it], there is a script being written, but I'm not sure." On 5 August 2015, while promoting Ritchie's film The Man from U.N.C.L.E., producer Lionel Wigram said that a script for a third film was still being written. Wigram also claimed that both Downey Jr. and Law would reprise their roles from the first two films. In April 2016, Downey confirmed that the film would begin shooting later in the year. That same month, it was announced that James Coyne was hired to rewrite the script. Silver, who will produce the sequel, stated that he hoped it would begin filming in the fall, and that there may be more sequels. On 27 October 2016, Variety reported that Warner Bros., Village Roadshow and Team Downey had put together a writers' room with several top names, including Nicole Perlman, Justin Malen, Gary Whitta, Geneva Robertson-Dworet and Kieran Fitzgerald. In May 2017, Wigram claimed that shooting may start in late 2018, saying, "It's closer to happening than it's been for a while. With any luck we'll be making it at the end of next year. I hope, we'll see. Fingers crossed." In May 2018, Warner Bros. confirmed a third film was scheduled for release on 25 December 2020, with Downey and Law reprising their roles and Chris Brancato writing the script. ^ "Sherlock Holmes: A Game of Shadows (12A)". British Board of Film Classification. Retrieved 1 December 2011. ^ Kaufman, Amy; Fritz, Ben (15 December 2011). "Movie Projector: 'Sherlock,' 'Alvin' sequels kick off holiday season". Los Angeles Times. Tribune Company. Retrieved 15 December 2011. ^ a b c d Tilly, Chris (22 February 2011). "Sherlock Holmes: A Game of Shadows Preview". IGN. Retrieved 9 March 2011. ^ a b c d Sciretta, Peter (27 May 2010). "Sherlock Holmes 2 Gets December 2011 Release Date, Rachel McAdams Will Return". /Film. Retrieved 18 October 2010. ^ a b c d Ffrench, Andrew (4 November 2010). "Sherlock movie stars steam into Didcot". The Oxford Times. Newsquest. Retrieved 28 November 2010. ^ "Jared Harris discusses 'fun' Sherlock Holmes 2". Total Film. Retrieved 22 March 2011. ^ Melrose, Kevin (23 November 2010). "Noomi Rapace to play Sim the Gypsy in 'Sherlock Holmes 2′". Spin Off Online. Retrieved 28 November 2010. ^ "Stephen Fry talks Sherlock Holmes 2". Total Film. Retrieved 22 March 2011. ^ a b Bierly, Mandi (4 February 2011). "Rachel McAdams cameo confirmed for 'Sherlock Holmes' sequel". Entertainment Weekly. Time Inc. Retrieved 12 February 2011. ^ "Eddie Marsan reprising Sherlock Holmes role". Collider.com. Retrieved 2 December 2010. ^ "Sherlock Holmes: A Game of Shadows Movie Review". ComingSoon.net. ^ Thompson, Jody (19 October 2010). 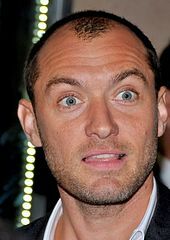 "Take that, you bounder: Jude Law takes swing at a gypsy in new Sherlock Holmes film (after quick practice on Guy Ritchie)". Daily Mail. UK: Associated Newspapers. Retrieved 28 November 2010. ^ "Guy Ritchie Leaving Lobo, Aiming for Sherlock Holmes 2". /Film. 26 January 2010. Retrieved 18 October 2010. ^ Ditzian, Eric (9 November 2010). "Rachel McAdams Unsure About Doing 'Sherlock Holmes 2'". MTV. Retrieved 9 January 2011. ^ a b "IAR EXCLUSIVE INTERVIEW: Producers Joel Silver and Susan Downey talk 'Sherlock Holmes: A Game of Shadows'". iamROGUE.com. Retrieved 11 January 2012. ^ Morgenstern, Joe (16 December 2011). "Mission: Impossible—Ghost Protocol | Carnage | Sherlock Holmes: A Game of Shadows | Stylish Spectacle Makes This 'Mission' Possible | Film Reviews by Joe Morgenstern – WSJ.com". Online.wsj.com. Retrieved 14 January 2012. ^ "Scott Mendelson: Review: Sherlock Holmes: A Game of Shadows". Huffingtonpost.com. 9 December 2011. Retrieved 14 January 2012. ^ Thompson, Jody (19 December 2009). "Jude Law takes swing at a gypsy in new Sherlock Holmes film (after quick practice on Guy Ritchie)". Daily Mail. UK: Associated Newspapers. Retrieved 20 October 2010. ^ Teed, Paul (24 January 2011). "Film crews at Hampton Court Palace 'shooting Sherlock Holmes movie'". Elmbridge Guardian. Newsquest. Archived from the original on 8 October 2011. Retrieved 4 February 2011. ^ "Explosions au coeur de Strasbourg… (Explosions in the heart of Strasbourg…)". Les Dernières Nouvelles d'Alsace (in French). 4 February 2011. Retrieved 4 February 2011. ^ "How 'Sherlock Holmes' Turned Hans Zimmer on to the Roma Cause". The Hollywood Reporter. 2011-12-19. Retrieved 2012-08-26. ^ "Sherlock Holmes: A Game of Shadows DVD". Amazon.com. Retrieved 22 April 2012. ^ "Sherlock Holmes: A Game of Shadows Blu-Ray". Amazon.com. Retrieved 22 April 2012. ^ "Sherlock Holmes: A Game of Shadows DVD UK". Amazon.co.uk. Retrieved 22 April 2012. ^ "Sherlock Holmes: A Game of Shadows Blu-Ray UK". Amazon.co.uk. Retrieved 22 April 2012. ^ "Sherlock Holmes: A Game of Shadows DVD Australia". dstore.com. Retrieved 14 May 2012. ^ 2011 "Worldwide Grosses", Box Office Mojo. ^ "Sherlock Holmes sequel leads US box office". BBC. 19 December 2011. ^ "Sherlock Holmes fires an opening salvo from the shadows at the UK box office". The Guardian. UK. 20 December 2011. ^ "Friday Report: 'Sherlock,' 'Alvin' Stumble, 'M:I' Dominant in IMAX". Boxofficemojo.com. 17 December 2011. ^ "Weekend Report: Disappointing Debuts From 'Sherlock,' 'Alvin' Sequels". Boxofficemojo.com. 19 December 2011. ^ 2011 DOMESTIC GROSSES, Box Office Mojo. ^ "Around-the-World Roundup: 'M:I-4' Lights Fuse Overseas". Retrieved 13 March 2012. ^ "Around-the-World Roundup: 'Sherlock' Finds Foreign Lead". Boxofficemojo.com. 9 January 2012. ^ "Around-the-World Roundup: 'Sherlock' Cracks Code Again". Boxofficemojo.com. 15 January 2012. ^ "Around-the-World Roundup: 'Sherlock' Outwits Competition for Third-Straight Weekend". Boxofficemojo.com. 25 January 2012. ^ "United Kingdom Box Office December 16–18, 2011". Boxofficemojo.com. ^ "Sherlock Holmes: A Game of Shadows (2011) - International Box Office Results - Box Office Mojo". boxofficemojo.com. ^ "Sherlock Holmes: A Game of Shadows (2011)". Rotten Tomatoes. Retrieved 20 June 2012. ^ "Sherlock Holmes: A Game of Shadows Reviews". Metacritic. Retrieved 16 December 2011. ^ "Sherlock Holmes: A Game of Shadows Reviews". CinemaScore. 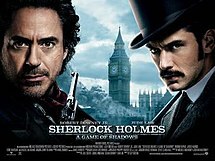 ^ "Sherlock Holmes: A Game of Shadows :: rogerebert.com :: Reviews". rogerebert.com. ^ "Sherlock Holmes: A Game of Shadows – Reelviews Movie Reviews". Reelviews.net. ^ Phipps, Keith (15 December 2011). "Sherlock Holmes: A Game Of Shadows | Film | Movie Review". The A.V. Club. ^ Tafoya, Scout (24 November 2015). "The Unloved - Sherlock Holmes: A Game of Shadows". Vimeo. Vimeo, Inc. Retrieved 20 October 2016. ^ Scout Tafoya [@honors_zombie] (23 August 2016). "Did this +all the Davies and KNIGHT OF CUPS, Robert Greene, VANISHING WAVES, Mungiu, ASSASSIN, all FF and S Coppola" (Tweet). Retrieved 20 October 2016 – via Twitter. ^ "Nominations for the 38th Annual Saturn Awards". Saturn Award. Academy of Science Fiction, Fantasy & Horror Films. 29 February 2012. Archived from the original on 29 February 2012. Retrieved 29 February 2012. ^ "First Wave of "Teen Choice 2012" Nominees Announced" (PDF). Teen Choice Awards. 18 May 2012. Archived from the original (PDF) on 18 May 2012. Retrieved 18 May 2012. ^ "10th Annual VES Awards". visual effects society. Retrieved 31 December 2017. ^ Fleming, Mike (23 October 2011). "Warner Bros Ready For 'Sherlock Holmes 3′". Deadline. Retrieved 20 December 2011. ^ "The Baker Street Babes : NEW news about the third "Sherlock Holmes" movie! ..." Baker Street Babes. ^ "Jude Law offers an update on Guy Ritchie's 'Sherlock Holmes 3'". Digital Spy. ^ "Jude Law Says 'Sherlock Holmes 3′ Is Slowly Moving Forward". Screen Rant. ^ "Susan Downey Talks The Judge, Sherlock Holmes 3, Pinocchio, Yucatan and More". Collider. ^ "Sherlock 3 may or may not be happening". 28 May 2015. ^ Chris Tilly (5 August 2015). "Producer Says He's Working On Sherlock Holmes 3 Script". IGN. Retrieved 5 August 2015. ^ "EXCLUSIVE: Downey Jr. confirms Sherlock Holmes 3 shooting this year". Shortlist. 20 April 2016. Retrieved 21 April 2016. ^ "James Coyne On The Case To Pen 'Sherlock Holmes 3' (by Patrick Hipes)". deadline.com. 25 April 2016. Retrieved 3 June 2016. ^ Adam Chitwood (19 May 2016). "'Sherlock Holmes 3': Producer Joel Silver Confirms Filming May Start This Fall; Teases More Sequels". Collider. Retrieved 19 May 2016. ^ Kroll, Justin (27 October 2016). "Warner Bros. and Team Downey Set Writers' Room for 'Sherlock Holmes 3' (EXCLUSIVE)". Variety. ^ Simpson, George (11 May 2017). "Sherlock Holmes 3 producer gives VERY exciting update for fans (EXCLUSIVE)". Daily Express. Retrieved 29 December 2017. ^ D'Alessandro, Anthony (7 May 2018). "Warner Bros. Dates 'Sherlock Holmes 3' For Christmas 2020". Deadline Hollywood. Penske Business Media. Retrieved 8 May 2018. Wikimedia Commons has media related to Sherlock Holmes: A Game of Shadows.